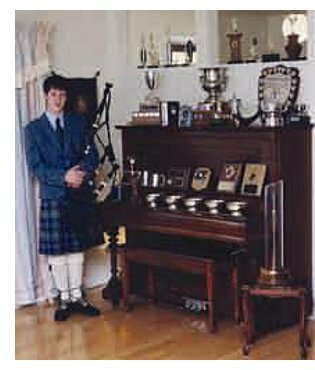 With his victory at the George Sherriff Invitational Amateur Solo Piping Competition in Hamilton, Ontario in November, 2001, Hector Macquarrie of Halifax, Nova Scotia was suddenly catapulted into the piping limelight. Those of us who knew this young man, and knew his family, were not surprised; we were already aware of his exceptional talent and his amazing dedication to the music which has been played by pipers in his family for at least eleven generations. Two of Hector’s sisters are Highland dancers and all three of them are pianists. One of them is also learning to play the fiddle. Hector himself plays piano, guitar, and a drum kit, but the bagpipe is his principle musical instrument. He was an avid hockey player, having started skating at age three. “I played Triple A all through the age categories,” says Hector, “and I played on Provincial teams from Novice through to Pee Wee. We went to tournaments in Boston, Quebec, and throughout the Maritimes playing against other Provincial teams from across the country. Once I took a year off from the pipe band because of hockey.” Last year, though, Hector refocused his priorities and chose to sacrifice hockey to concentrate on his piping. Hector stayed with Ian for three years and by then was playing in the Dartmouth Junior’s Grade 5 Pipe Band. He also started going to John MacLean for lessons that year. “I was really scared of him the first few lessons,” recalls Hector, “but he is an amazing teacher. He stresses accuracy of technique, which is very important, but he is also strongly focused on the music. “John is one of the most musical players I’ve ever heard. And he has lots of stories about the old players, and of the fiddlers too. He played his pipes for me regularly, which helped me fix in my head what a great set of bagpipes should sound like. I try to get my own to sound just like his. During this period, Hector also went for several lessons to Bruce Gandy in PEI and Bruce worked with him prior to the major international competitions he had been invited to enter. Hector’s father, Marcie is quick to point out, “The Nova Scotian piping community is extremely fortunate that Bruce decided to come and live in the Halifax area”, and Hector agrees. “After the Nicol-Brown and George Sherriff competitions,” he says, “I started going to Bruce regularly every two weeks or so and before long I was seeing him every week. As we got closer to the time for the big competitions, he started taking me twice and even occasionally three times a week. Early on, the lessons were mostly on the practice chanter but, as the year progressed, more time was spent on the pipes. By the end of the year, the entire lesson was on pipes every time. “Bruce is very demanding,” says Hector. “He does not tolerate so much as a missed gracenote! In the big competitions, you see, where all the pipers are in top form and playing on well-tuned instruments, errors are deadly. You have to train yourself to play perfectly. You have to be dedicated to it. But Bruce also stresses the music. Both are important. Proper execution of all the movements and musical expression go hand in hand. It has all certainly paid off. Over the short span of his piping career to date, Hector won a large number of awards. Among the most prestigious were the Atlantic Canada Champion Supreme titles he won in Grades 4, 3, and 2, and also the titles for Junior Amateur Piobaireachd and Junior Amateur Jig. Competing in Grade 1 in 2001, and doing well in both light music and piobaireachd, Hector was invited to participate in the Nicol-Brown Invitational Amateur Solo Piping Competition at Trinity College in Hartford, Connecticut. Competing against some of North America’s finest amateur players, he placed second in both the Piobaireachd and the March, Strathspey and Reel events, and third in the 6/8 March event to finish in second place overall. About five weeks later, he was in Hamilton, Ontario to take part in the George Sherriff Invitational Amateur Solo Piping Competition where he took first places in the Piobaireachd and the March, Strathspey and Reel, and a second in the 6/8 March to finish first overall. His prize included a round trip to Scotland, which he took in 2002. Hector remembers these competitions for more than just the prizes won, however. “Going on the ferry from Yarmouth to attend the Nicol-Brown,” he says, “I was practicing my pipes on the deck and, when I turned around, there was a big crowd gathered there listening to me. That was pretty cool. And on the return trip, which was shortly after 9/11, the customs officer was going through our stuff when he saw my pipes. He asked if I could play ‘Amazing Grace’ and I picked up my chanter and played it for him. His face lit up in a grin from ear to ear. When I finished, he waved us all through. As I was interviewing Hector for the first time, his proud grandfather, Angus, a lifelong fisherman and the former warden of Antigonish County, sat with us in Doctor’s Brook, on a beautiful sunny March day, overlooking the clear blue waters of the Northumberland Strait. Angus was the one who noticed the two deer casually wandering across the clearing in front of the cottage, between us and the water. He was also the one who filled in bits and pieces of Hector’s amazing piping lineage. This past August, grandfather Angus joined sons Marcie and Paul and grandson Hector in their travel to Scotland. Angus watched and listened with justifiable pride as the young man vied for top honours among some of the best young pipers in the world. “I was able to play in the Under 18 events in some places,” Hector recalls, “but in others, such as at Glenfinnan, I found myself up against experienced pipers I had only read about before. It was a terrifying experience, but a rewarding one too.” Rewarding in more than once sense of the word, for Hector came home with first and third prizes from the Lonach Games, and first and second prizes in the March, Strathspey and Reel, and Piobaireachd events from the Cowal Games. He also competed at the MacGregor Cup Invitational Competition at Oban. A tour of the land of their ancestors brought the four Macquarrie men to Fort William, Glenfinnan, Mull, Ulva, Arisaig, Morar, Mallaig, Skye, and on to their ancestral home on the Isle of Eigg. Hector, Marcie and Paul laid their stones beside Angus’s, and his father’s before him, on the cairn of their ancestor, Donald Macquarrie, Am Piobaire Mor, the tradition continued into yet another generation. Back home in Halifax Nova Scotia, Hector, now a Grade 12 student at the Halifax Grammar School, was preparing to defend his title at the George Sherriff competition when his 84 year old grandfather was suddenly rushed to the hospital. As his condition worsened, Angus was transferred from Antigonish to the QE2 Health Science Centre in Halifax where Hector spent many hours at his bedside, playing all the old tunes for him on his practice chanter. Angus would drift in and out of consciousness and occasionally would comment. “Port Math”, he would say in Gaelic, “good tune”. Consequently, Hector was unable to play at the George Sherriff this year, but there will be other opportunities. Angus passed away peacefully on November 10th and was buried in Arisaig’s St. Margaret of Scotland Parish Cemetery on the 13th. As he watched over his grandson in life, Angus, no doubt surrounded by his many piper ancestors, continues to watch over him, and to listen proudly. To be sure, there may be a lot of pressure, being the eleventh in a line of Macquarrie pipers, but Hector’s young shoulders are broad and strong, and he will do just fine.